Hockey Plumber: What Is Wrong With Marc-André Fleury? Just what is going on with "Flower"? Marc-André Fleury is one of the more divisive players in the NHL today. Divisive not because of his personality or attitude, but because of his play. Fleury has never been a stats guy. He has not posted stellar save percentages. He has never wowed anyone with his GAA. However, the one department that Marc-André Fleury has nearly always impressed is in the win column. There are two camps in the MAF battle. The Critics/Haters, who have always believed that Fleury surrenders too many soft goals, and has been the beneficiary of playing with a talented cast of skaters. Then there are the Loyalists/Apologists. This group clings to the Stanley Cup runs, his incredible athleticism, Pittsburgh's offensive-focused style of play and the "Secret Service Save." Regardless to which camp you belong, Marc-André Fleury has begun the '10-'11 Season with a 1-4-0 record, a slightly scary 3.41 GAA, and an abysmal .861 save percentage. 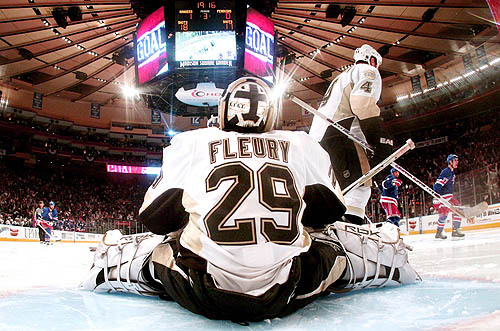 The Apologist hypothesizes that Fleury usually starts slowly. Is this true? Let's take a look a seasons past. "Flower" started 8-0-0, and finished October with a record of 9-2-0, giving up more than 2 goals only 3 times. Was 4-3-2 in October, but again gave up more than 2 goals only 3 times in 9 starts. Was his worst October until this season. A 4-4-0 record. Fleury gave up more than 2 goals in 6 different games, including 4 or more goals 5 times. An October of 6-3-0, more than 2 goals 4 times. Opened the season with a shutout. We would say that Fleury is having an unusually slow start this season. The Critics say he has let in too many softies, and is not playing technically sound hockey. Is this true? It's only been five games, so let's look at every goal he has allowed thus far. 1. Danny Briere: A tip-in on the power play. Not soft. No chance for any goalie. 2. Blair Betts: Even strength. 3 on 3 break into the zone. Fleury stops initial shot the rebound goes right by a Pittsburgh defender to Betts who shoots it into an empty net. Not soft. No chance for MAF. 3. Claude Giroux: Short handed. Awful giveaway by a Pens defender. Giroux deeks and beats Fleury. Not soft. Fleury had a chance. 1. Mike Cammalleri: Even strength. Plekanec carries the puck to the side of the net, passes back to an unchecked Cammalleri in the slot who shoots it in. Not soft. Fluery had a chance, but would have had to make a highlight reel save. 2. Mike Cammalleri: Even strength. Shot from the point is deflected by Cammi. Not soft. No chance. 3. Scott Gomez: Even strength. Gomez skates the puck nearly to the goal line, flicks it toward the goal. The puck sneaks in past Fleury. Soft. Soft. Soft. 1. Colton Orr: Even strength. Shot from the point is deflected by Orr. Not soft. Little chance. 2. Clarke MacArthur: A one-timer on the power play. Not soft. Fleury had a slim chance didn't react in time. 3. Francois Beauchemin: Even strength. Blast from the point makes it through traffic. Not soft. Fleury was only partially screened. Could have had it. 4. Clarke MacArthur: Even strength. Pass from behind the net to a wide open MacArthur in the slot. Not soft. No chance. 1. David Legwand: Even strength. Pass across the crease to a wide open Legwand. Not Soft. No chance. 2. Cody Franson: PPG. Shot from the point is deflected off a Pittsburgh defender. Not soft. No chance. 3. Patric Hornqvist: Even strength. Hornqvist picks up a quick drop pass and unleashes a rocket that Fleury never saw. Not soft. No chance. 1. Dana Tyrell: Even strength. A pass from behind the net is jammed past Fleury Not Soft. Tough to stop. 2. Teddy Purcell: Even strength. Purcell carried into the zone a beat Fleury with a wrister. Not Soft, but iffy. He saw it all the way. 3. Vinny Lecavalier: PPG. 5 on 3 slapper. Not soft. No chance. 4. Martin St. Louis: Even strength. St. Louis blew past the Pittsburgh defenders and beat Fleury's diving poke check. Not soft. Maybe too aggressive/desperate. 5. Martin St. Louis: Empty net. So what IS wrong with MAF? It's just hockey. Sometimes you get the bounces... sometimes they get you. When Fleury has started quickly... the occasional 4 goal game was offset by 5 goals by the Penguins. In only five games this year, Fleury just hasn't caught many breaks. Defensive lapses, mediocre PK, combined with some low scoring efforts by Crosby, Malkin & Co. have added up to a poor start. Has he played great? No But has he been awful? No way. Had the Penguins' offense pasted teams with some 5 or 6 goal efforts along the way, (as they have in previous Octobers) no one would be talking about Fleury. Yet, for now, his 1 win in 5 attempts has created an even greater divide.